Itch..itch..scratch..scratch.. OH! I am going bonkers! I've had unexplained hives for 2 months and its just making me crazy! They're everywhere with a focus on my face, arms and legs. I've removed all scented items from my daily routine and started using a new essential oil to help with the hives. But..I needed some kind of soap to shower with and that is what this blog post about! 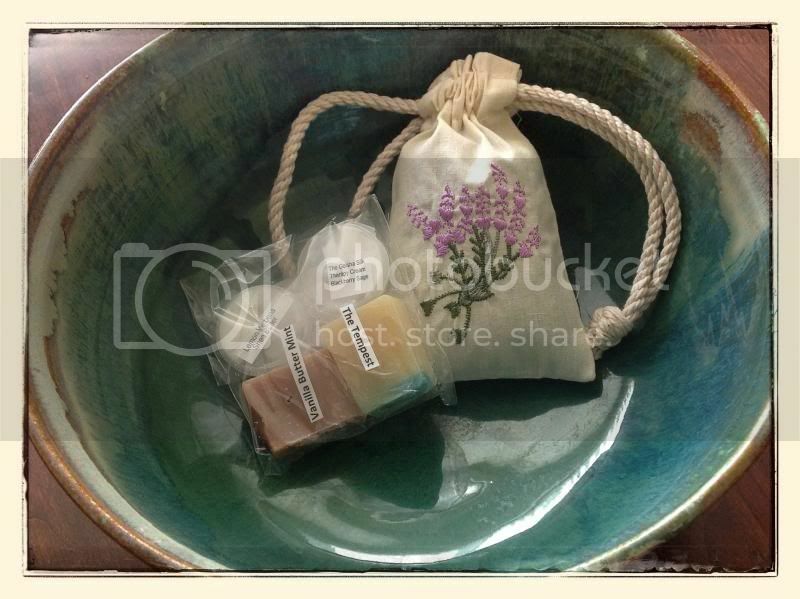 I ordered handmade soap and goodies from Allegheny Hearth,Soapsmith on Artfire and am just delighted! Allegheny Hearth is run by Bonnie Klisiewicz Bartley from Altoona, PA (another Central PA gal representing!!) and has been crafting handmade soap for over 30 years! That's longer than I've been alive so who better to help me with my itchies?! I've "known" her for a few years now throughout the online soaping and handmade communities and she is wonderful. She is one of the kindest, most helpful people I have the pleasure of knowing. I wish we lived closer, I'd take her out for tea because she is just a lovely human being. 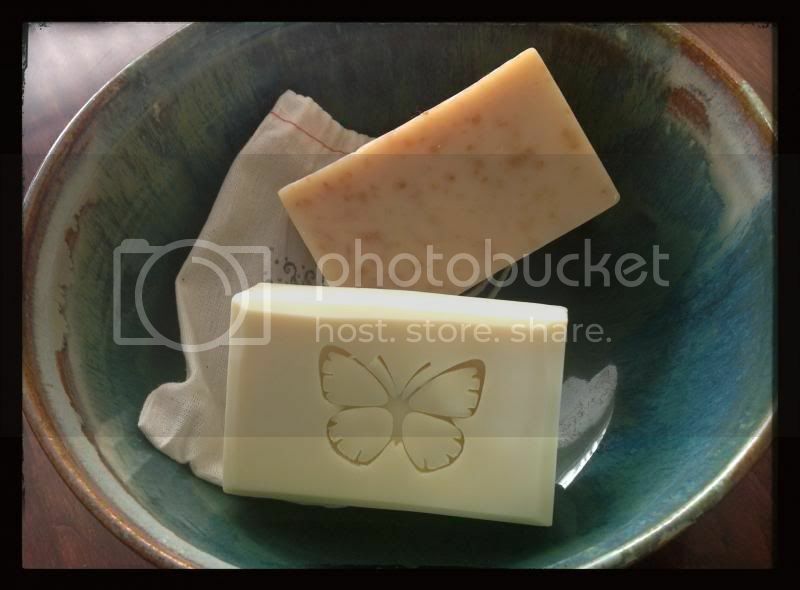 I chose two classics, Olive Castile and Lavender Oatmeal bar soap. Both are known for being extremely gentle. First off, I want to say these bars are LARGE..which would usually turn me off. I have smaller hands and some bars are awkward to hold. However, these bars are more narrow than wide, making them fit nicely into your hand. The Castile bar is crafted with organic olive oil and while it is unscented, it has a wonderful clean aroma. I chose this bar specifically for washing my face. I have very sensitive skin that turns red and dry very easily. The Castile bar lathered up so nicely with tiny, silky bubbles that cleansed my face and washed away, leaving it soft. I hate that tight feeling some facial cleansers leave behind! Plus, how cute is that butterfly stamped into the bar?! So girly and pretty. I picked the Lavender Oatmeal bar for body cleansing. To be honest, I should use an unscented bar until I figure out what's causing the hives but I just can't take a bath with unscented soap! It just seems wrong. So my best bet was a gentle, essential oil soap and this Lavender Oatmeal bar is perfection! Handcrafted with Goatsmilk, Honey and Oatmeal, it is excellent for dry, irritated skin. My mood has little agitated ever since the hives showed up and the calming Lavender aroma is so nice. It lathered up with creamy, luscious bubbles that washed away, leaving softly scented skin. ﻿Next up, I had to order a little gift for my Mom. She deserves it after listening to me complain all day, every day about my itchies! 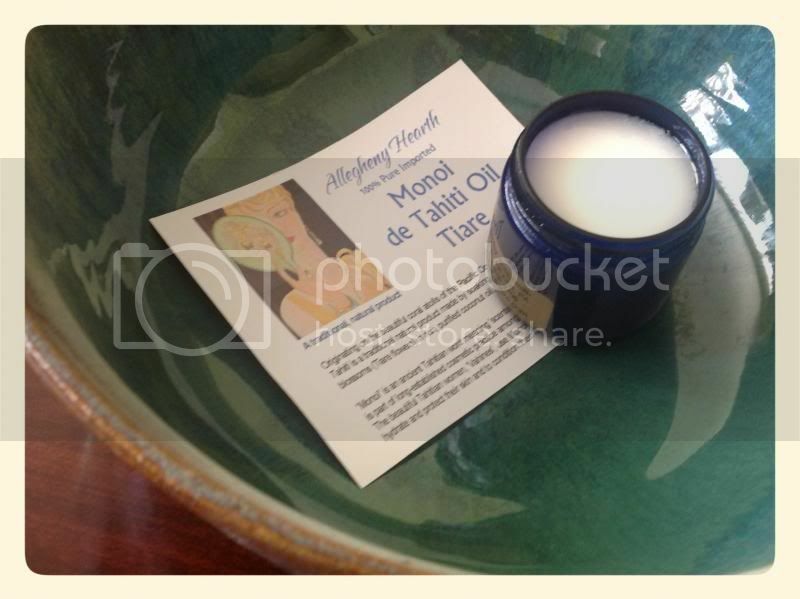 I decided to get glorious Monoi de Tahiti Tiare Oil, which is an amazingly versatile item. If you've never smelled Tiare oil, you're missing out! Genuine Gardenia flowers are crushed in 100% Coconut oil..resulting in an intoxicating, heady oil/balm that is so sensual. Used for everything from a body moisturizer to a hair treatment, my Mom begged a foot massage(she broke her ankle a few years ago and has such pain) out of me! Bonnie thoughtfully tucked these awesome free samples into my package, which was totally unexpected! The gorgeous Lavender embroidered sachet contains the most amazingly scented lavender buds. The organic lavender is grown by Bonnie and harvested at the peak of the season. So precious, I can see these tied onto a beautifully wrapped gift box instead of a bow! The samples were also a nice treat. I'm not big on fruity scented items but the Blackberry Sage Shea Butter is lightly scented and will be nice for summer. I adore the Lemon Verbena Shea Butter! Its such a refreshing, clean aroma and the shea butter sinks right into your skin. The two soap samples are also great; Tempest being a nice clean, unisex scent and Vanilla Butter Mint is a warm, creamy scent that is very interesting. The mint adds a little crisp edge to the buttery aroma. I'm thrilled with my purchase and will definitely be ordering again. Next up, I would love to try one of Bonnie's body powders. I have my eye on the Lavender Chamomile and a gorgeous handmade Merino Wool Puff. I love using things that make you feel feminine! Check out Allegheny Hearth, the product line is extensive and you will be just as happy as I am. Now, hives..hit the road!! I'm Sarah and I live in a small town in Pennsylvania. I love everything vintage, romantic and am passionate about keeping our Earth green.